Inspirational linebacker Will White has been handed a new assignment to tackle. The Defensive Captain has been appointed General Manager of the Coventry Cassidy Jets following in the footsteps of Pete Evans who resigned in April. Club Secretary Adam Etheridge had been filling the role temporarily whilst a successor to Evans' was being sought. “I'm honoured and extremely proud to be appointed GM of the number one team in Britain” exclaimed White, “We only have a very brief history but we've achieved an awful lot in that time. We have a winning tradition on the field and we intend to keep it that way”. The Jets have lost only two domestic games over the past 4 seasons culminating in a 33-32 victory over the London Blitz in September's National Title game. Etheridge, who will be returning to his old role commented “Will has shown in the 3 years he's been with us that he's got the passion and determination to succeed at anything. I'm sure I speak for everyone at the club when I say that we've found the right man for the job”. White wa elected unanimously at the club's recent AGM. 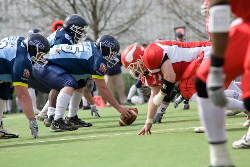 2009 looks like being another momentous season for the Jets as they embark upon their sixth season and look to retain their Britbowl crown. “We're determined to get back to the Keepmoat in September and keep our hands on the Boston Trophy” said the ambitious White “but before we can focus on domestic matters we have the EFAF Cup to keep us busy”. Apart from the European and Domestic campaigns the Jets have also been working towards finding a new home venue after playing much of the past 2 years at Warwick University. Marketing Manager Parm Sidhu has been negotiating a lease at a stadium venue in the City “Warwick have been excellent hosts but we need to move back into a stadium and start to rebuild our fan base. Negotiations have progressed nicely and we expect to strike a mutually beneficial deal shortly”.